The IC-R30 raises the bar on the DC to Daylight portable receivers! 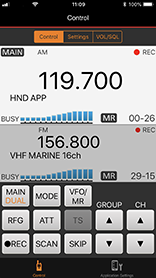 Covering 0.1–3304.999 MHz*, the R30 portable receiver gives users the ability to decode multiple digital modes, as well as, traditional analog modes. The large LCD display makes operating the radio a breeze with a new intuitive user interface allowing you to see information from the dual receivers. With dual receive operation, you can simultaneously listen to two signals and record the activity to share the excitement with others. The supplied Li-Ion battery, BP-287, provides almost 8.5 hours of operating time (internal speaker, volume @ 20, GPS – on, Bluetooth® - off). The R30 can receive on different bands and different modes. For example, users can monitor HF and UHF signals simultaneously. The R30 also allows users to scan for other active channels on the B band while receiving the main signal on the A band. Individually record the audio of the two bands received while in the Dualwatch mode onto a microSD card* in the WAV format. Play back the recorded audio on the receiver or a PC. In addition, frequency, mode, S-meter reading, time, current position data and altitude can be saved with received audio. Use a microSD card* for data storage. Recording/playback of received audio, RX history log, radio set tings and GPS logger data can all be loaded onto the microSD card. The R30 scans approximately 200 channels per second in the A band and 150 channels per second in the B band. Quickly find and lock in to a desired signal. Near station scan - Using GPS location information and the Memory channels, the R30 can display and scan up to 50 stations within 160km from your current location, in proximity order. Just program the station’s position data in advance. Auto memory write scan - Automatically stores received frequencies (up to 200Ch) during a Programmed scan. Priority scan - Checks for signals on a frequency every 5 seconds, while operating on a VFO frequency or scanning. 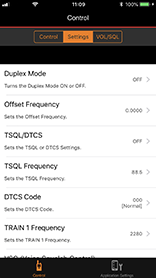 Tone scan - Detects a sub-audible tone frequency or the DTCS code in a received signal. And many more including: Program scan, Memory scan, Memory mode scan, Group scan, Group link scan. The integrated GPS receiver displays your current position data, course, speed and altitude on the display. Save the GPS data in recorded audio files. The R30 can list up to 50 stations approximately 100 miles from your current location, as long as the station’s position data is programmed in advance in the memory channels. Remotely control the IC-R30 from your favorite iOS™ and Android™ device. Utilizing the built-in Bluetooth® feature, remotely control dual receivers, VFO operation, memory channels, a variety of scans, and various function settings. Combine that with Icom’s multipoint connection VS-3 Bluetooth® headset, and you will never feel tethered to your receiver again. This combination allows you to listen to your favorite smart device apps* as well as your R30*, scanning your favorite channels. Download the RS-R30 brochure to learn more. 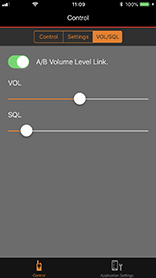 *The VS-3 plays either the app or R30 audio, not simultaneously.